Reclaimed Walnut Flooring heartwood is usually dark brown, sometimes with a hint of purple. The sapwood has a lighter tan coloring. As the walnut ages, it becomes lighter in color and takes on more of an amber coloring. 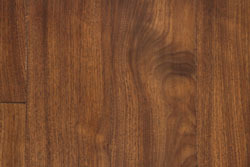 Reclaimed Walnut is straight grained with a coarse uniform texture. Reclaimed Walnut provides a deep rich flooring style suitable to any contemporary or traditional home.